The Rotary Youth Leadership Awards, or RYLA, is a weekend event with the purpose of training High School Students (primarily Sophomores) in aspects of character-building, personal development, good citizenship and leadership. 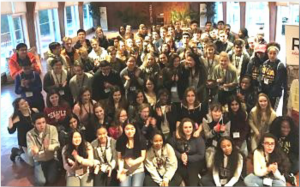 Each year, Rotary districts around the world hold a RYLA event modeled as a conference-workshop, or camp for the district’s Interactors, Rotaractors, and Youth Exchange students. It became an official Rotary International program in 1971. During personal development and good citizenship trainings, participants build self-confidence and self-esteem, as well as learn about problem-solving, conflict management, and the elements of community and global citizenship. By the end of the program, RYLA participants will be prepared to take those skills and establish themselves as youth leaders in their communities. The RYLA Committee works throughout the year with clubs, Rotary youth liaisons, Interact and Rotaract advisors to be of the RYLA event. Rotaractors are recruited to work with the students during the weekend.